At Oceana, we fight for national policies in key countries around the world. We win key victories for the oceans that stop overfishing, reduce bycatch, limit pollution, preserve habitat and protect wildlife. But responsible policies like those we advocate for depend upon effective monitoring and enforcement to be successful. Today, at the 2016 Our Ocean Conference, Oceana helped unveil a powerful new tool that will make these prerequisites easier to achieve: Global Fishing Watch. Global Fishing Watch is the result of a partnership between Oceana, SkyTruth and Google. It is the first-ever technology platform that enables anyone with an internet connection to see global fishing activity and track commercial fishing vessels in near real-time - for free. 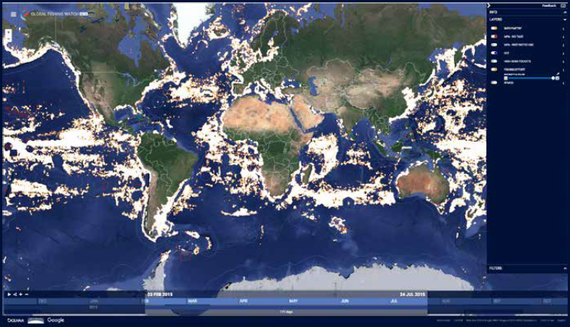 With Global Fishing Watch, users can visualize the global fishing fleet in space and time to reveal the intensity of fishing activity around the world. Users can track and measure both near real-time and historical commercial fishing activity using the Global Fishing Watch heat map. They can also view individual vessel tracks, exclusive economic zones, marine protected areas and other features. Hundreds of millions of people depend on the ocean for their livelihoods and approximately 3 billion rely on it as a primary food source. However, the world's oceans are threatened by global overfishing, illegal fishing and habitat destruction. These threats could undermine the many benefits the oceans provide us with. Governments face a challenge in managing oceans sustainably. Sharing information more transparently on how our oceans are being used is essential to keeping our oceans healthy and bringing back abundance. Global Fishing Watch can drive science and innovation, and improve decision-making about the effective management of the world's fisheries and oceans. It will harness the power of citizen engagement to help rebuild and maintain abundant oceans and provide a powerful tool to show consumers where and by whom their fish are being caught. Together, the uses of Global Fishing Watch will promote healthier oceans and more effective policymaking around the world. This exciting new tool is live and available now. Try it out for yourself at www.globalfishingwatch.org.